Saint Lachtain’s Church in Freshford, Co Kilkenny, is the Church of Ireland parish church of Freshford, and is in regular use; although the Sunday congregations may be small, there is a service here every Sunday. The whole site is a place of great antiquity, but usually it is known only for the Hiberno-Romanesque porch at the west end of the church. Because the porch at the west end faces a busy thoroughfare, it is often passed at a pace that allows little or no appreciation of its importance. And even when the porch attracts appreciative attention, the rest of the site is often ignored. I hope this afternoon to tell the story of the whole site. We shall take a detailed look at the porch and doorway, of course. But we shall also look at the church in detail, so that we can share a realisation this whole site is part of our shared heritage and history. I hope to show that the church itself dates back to the early history of the site, and that all around we have a compact and cohesive site that is important for Church History, local history, architectural history, archaeology, for Co Kilkenny and the Diocese of Ossory, and of national importance too. Saint Lachtain’s Church, surrounded by a walled graveyard, is in a prominent location at the north-east corner of the square, at the junction of Newbridge Road on the west side of the site and Kilkenny Street on the south side of the site. This is a tiny site. It covers an area of only 0.2 acres that is roughly trapezoidal in shape (a convex quadrilateral with at least one set of parallel sides), and it is enclosed by a limestone rubble wall with concrete capping. The original name of the parish is Achadh Úr (‘fresh field’), sometimes anglicised as Aghour. The parish of Aghour is now grouped with three other Church of Ireland parishes: Saint Canice’s and Saint John’s, both in Kilkenny, and Saint Aidan’s in Kilmanagh. The rector is the Dean of Ossory, the Very Revd Katharine Poulton. This saint, also called Lactenus, Lactinius and Lactanus, came from a distinguished family in Muskerry, Co Cork. 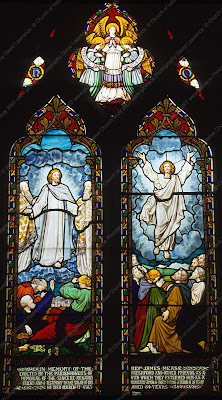 According to legend, while Saint Molua lived as a disciple of Saint Comgall of Bangor, an angel appeared to him and predicted the birth of Lactinus – after an interval of 15 years – who was to be his future friend and companion. Afterwards, it was related, that Molua never smiled, until he heard of the infant’s birth. He was born some time in the sixth century, and his mother is called Senecha. The accounts of his birth are drawn from accounts of the births of Jacob, Jeremiah and Saint John the Baptist, who were blessed before they were born. It is said that as an infant Lactinus was miraculously preserved from suffering and also healed his mother from a dangerous tumour and saved neighbours’ cattle from a plague. When he was 14, he moved to Saint Comgall’s new abbey in Bangor, where Saint Molu was his teacher. He was sent out to found religious houses, and these included Achadh Úr or Freshford. He died on 19 March 622, according to the Annals and the martyrologies. Lislaughtin Priory in north Co Kerry, founded by Franciscans in 1464 or in 1478, is said to have been dedicated to him. We do not know the exact date of the foundation of the monastery in Freshford. It must have been in existence by the early seventh century, before the death of the founder and first abbot, Saint Lachtain, in 622. The monastery is mentioned frequently in the Annals, so this was a foundation of some significance. In a raid in 836, the Vikings burned the church, robbed the monastery of its gold and silver ornaments and burnt all its books. But the monastery recovered and prospered. The Annals record a church built here in 909 AD, and we are going to see inside the church why I believe that the same survives as the main part of the church that still stands on this site to this day. 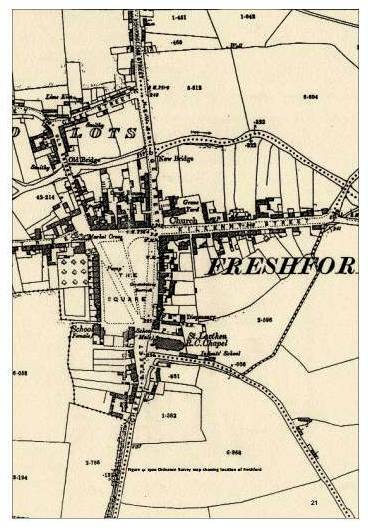 During the early 12th century, it seems, there were strong efforts to have Achadh Úr recognised as the episcopal centre of the new Diocese of Ossory. This may explain the addition of the elaborate porch to the earlier church, as secular patronage of this type would have benefited both the status of the church and the benefactors. In spite of these efforts, Achadh Úr was not proposed as a centre of the diocese at any of the reforming synods in the 12th century. At the Synod of Rath Breasail in 1111, when Ireland was divided into the dioceses, mainly as we know them today, the centre of the Diocese of Ossory, including present-day Co Kilkenny, and parts of Laois and Offaly, was moved from Seir Kieran to Aghaboe in Co Laois. The centre of the see later moved to Kilkenny, and the claims of Achadh Úr as an episcopal centre were not recognised at the subsequent Synod of Kells-Mellifont (1152), nor at the Synod of Cashel (1172). By 1218, Achadh Úr was part of the temporalities of the See of Ossory, the lands and estates possessed by the Bishop of Ossory, and was attached to Saint Canice’s Cathedral, Kilkenny, as a prebendal church, sharing its revenues to support a Prebendary of the cathedral. To this day, Aghour is the title of one of the senior canons of Saint Canice’s Cathedral – today the Prebendary of Aghour is Canon Susan Green, Chaplain of Kilkenny College. The church is built of limestone rubble, and has been much altered since the Reformation. The best-known feature is the fine sandstone Romanesque gabled porch facing the street at the west end. We have Episcopal Visitation records referring to the church fabric in 1622 and 1679, record that the chancel was then in ruins and the nave in some disarray. In his Visitation in 1731, Edward Tenison, Bishop of Ossory (1730-1735) – known to Jonathan Swift as “the baboon of Kilkenny” – describes ivy around the chancel and an elder tree growing from it. This implies the chancel was still in a ruinous condition. He records the unevenness of the floor and the fact that the pews were out of repair, but he mentions the presence of timber lying nearby for their repair. But by 1732, the church had been re-roofed, and the visitation that year notes that “the nave is in a much better condition than last year.” Later visitations tell us that from this point on the church was kept in good repair. The annexe, which serves as a vestry, was added to the north side of the church in 1824 and was later extended to the boundary of the site. A number of minor repairs to the church are recorded in the vestry minute books from 1824 on. However, for the period 1833-1876 the lack of entries is significant. Throughout that time, Canon Luke Fowler was Rector (1824-1876), and he is associated with two sets of the stained glass windows in the church. Other evidence for the state of the church fabric comes from a number of sketches of the porch, and a description in the 1870s by the architect and historian RR Brash, all indicating that the porch lacked the upper courses of its gable. Major renovations were carried out in the 1860s by Welland and Gillespie, architects to the Ecclesiastical Commissioners. Their drawings, now in the Representative Church Body (RCB) Library, include designs for the repaired porch and circular window, the hammer-beam roof and chancel arch, and for the pews, choir stalls, lectern, pulpit and gallery rails. Further alterations were carried out in 1877. Other furnishings were added in the 20th century: the carved altar rails were commissioned around 1900 by Canon Joseph McCheane, Rector of Aghour (1876-1926); electric lighting was installed in 1929; a major refurbishment of the sanctuary began in 1949, and included a new Communion Table and reredos donated by the St George family, the installation of a terrazzo floor, and replacing the panelling on the sanctuary walls. The church is a two-cell structure of roughly coursed rough-cut limestone and a significant proportion of carboniferous sandstone, all of local origin. The 12th-century porch is made of honey-coloured yellow/white sandstone. The 19th century additions to the west façade are also of yellow/white sandstone. There is some re-use of cut stone, including a number of pieces of radially cut limestone ashlar in the south wall of the nave. This may have come from the fabric of a curved structure, perhaps a round tower or belfry tower, which makes us ask whether a round tower also once stood on this site. The building is roofed throughout with stone slate. The 19th-century additions include a bellcote at the apex of the western gable, and a chimney at the junction between the nave and the chancel. So, now that we know the background and structure of the building, let us move out, first to the graveyard, and then to the porch. Outside, we have the graveyard enclosure and a Garden of Remembrance, which contain a small number of burials ... although we also know there were burials within the present parameters of the church. We are not certain when the graveyard boundary was established. A map by John Brownrigg and John Longfield from ca 1784-1824 shows the line of the boundary wall as it exists today, apart from the western line that was slightly altered when Newbridge Street was built. The majority of burials within the larger enclosure date to the 19th century, although parts of two 17th century monuments are preserved, one of which is built into the graveyard wall beside the entrance gate. For those of you interested in flora and fauna, and the bird and plant species in the graveyard, you might like to know that because the headstones have not been cleaned they now show a variety of lichens. Also, there is a substantial ash tree behind the church, but otherwise there is little of special significance in the vegetation within the graveyard, although it has its own, self-contained mini-eco-system. Or do Gilla-Mocholmoc u Ce[nn]cucain do rigne. Or do Neim ingin Cuirc acus do Mathgamain u Chiarmeic lasndernad in tempul-sa. Pray for Gilla Mocholmoc O Cennucain who made it. Pray for Neim [Niamh], daughter of Curc and for Mathgamain O Chiarmeic, for whom this church was made. Fragmentary inscriptions survive at Killeshin and Mona Incha, but the portal at Freshford is the only Romanesque monument to retain a complete inscription. However, the builder and patron named in the inscription in Freshford have not been identified or placed in history. The jambs are square, with three recessed rectangular panels on the reveal of each jamb, framed by broad raised bands and linked by vertical bands. Left jamb: the lower two recessed panels are empty and the top is filled with a rough block of stone. Right jamb: the middle frame has some cable decoration on the west side, and the top frame contains an inset rectangular panel with two standing figures. The figures wear long robes, and each carries a staff. Their heads are inclined towards each other and resting on their hands. The panel does not fit its location and below it has some concrete and other materials, perhaps slate. The lower edge of the panel is irregular and it looks as if the feet have been broken off. The stone surface is worn, so that no detailed features can be seen with the naked eye. Notice the incised equal-armed cross on the face of the left jamb, on the sixth stone from the bottom, and how there is a similar cross on the south (right) jamb at the same level – the fifth stone on the south. These crosses are at about 1.30 metres from the ground. The arch has a plain soffit or underside. The face has an inscription running in two bands around the arch, the inner band continuing down part of the face of the right jamb, the outer band only at the top of the arch. The jambs comprise nook shafts, with sections alternately attached and detached. The base of the left jamb is quite damaged, but may have had spurs. The base of the right jamb has raised bosses between torus or roll mouldings. Left capital: a multi-scallop foliage capital, with stamens between cones, and roll necking. Right capital: a multi-scallop foliage capital, with roll necking. The left impost has bosses on the chamfer, which is damaged; the right impost has pellets on the chamfer, which is also damaged. The arch has two rows of chevrons, frontal to the face, comprising rolls flanked by wedges. The jambs comprise nook shafts, with sections alternately attached and detached. The left and right bases are damaged. The left capital: multi-scallop with roll necking. The right capital: as the left capital. The left impost has bosses on the chamfer, which is damaged. The right impost has pellet ornament on the chamfer. The imposts continue as a string-course through the interior of the porch. The arch has one row of lateral chevrons flanked by wedges on the face and the soffit, forming a cog-wheel edge. The porch reveal has paired attached colonnettes. The bases are damaged. The left capital is a double capital and very weathered. It has human heads at the angles and in the centre of the south face of each capital, and animal bodies on the west face and over the join between the two capitals. The right capital is a double capital carved as a continuous frieze above necking, with human heads at the angles, which are much worn, linked by an animal body viewed from above across the north face. The imposts have pellets on the chamfer, which are very worn too. The imposts continue as a string course on the face and sides of the porch. The arch has a geometric pattern of intersecting bands in step-pattern surrounding plain panels, on the face and soffit. The soffit has beading between the mouldings. There are lion masks at the base of the soffit on both sides. Have a look at the human head in high relief on the face of the axial voussoir. The label is chamfered, with pellets. The outer order is carved with an elaborate step pattern and masks with animal forms. This is separated from the three inner orders of the doorway by a shallow barrel vault. On the west face, level with the springing of the outer order arch, are two figurative panels – one depicting a rider figure, the other two ecclesiastics. These, like a third figurative panel set into the jamb of the inner order, do not appear to be in their original locations. The left and right of the springing of the arch, on the face of the porch, above the beaded string course and below the chamfered mouldings, are much worn figured relief panels. The left panel contains a horse and rider in profile, facing right. The horse appears to be prancing, and there are faint traces of a raised shape beneath the horse. The right panel has two standing figures, wearing long robes, turning towards each other with arms outstretched, and possibly holding a crozier between them. Does this represent the monastery’s ambitions for diocesan status? The porch has a shallow gable, projecting about 0.68 metres from the façade. The upper part of the gable is a modern restoration, with a plain square surround, and a cross inscribed in a circle at the top of gable. The antae are surmounted by imposts with a hollow chamfer containing pellets. The porch dates from the 12th century. In style, the sculptures, particularly the capitals of the second and third orders, can be related to Cormac’s Chapel in Cashel, which has been accurately dated to between 1127 and 1134. Structurally, the inner order arch – which is continuous and square in section – is similar to the arches in Clonkeen, Co Limerick, and Aghadoe, Co Kerry. Now, because, the one on Aghadoe, near Killarney, dates from 1158, we can safely say this porch in Freshford was built some time around, say, 1140-1150. The barrel-vaulted porch is unusual in Ireland; the only other comparable example being the north porch at Cormac’s Chapel on the Rock of Cashel. The capitals of the inner orders of the portal can also be most closely paralleled with the north porch at Cormac’s Chapel (ca 1134). The sculptural decoration includes motifs found at a number of sites, mainly in Munster and Leinster. A similar step-pattern is found on the doorways at Aghadoe, Co Kerry, and Killeshin, Co Carlow, and on the fragmentary remains of a doorway at Clonattin, Co Wexford. The use of a human head on the keystone is a common feature in Ireland, and is found at Killeshin, Clonkeen, Ullard (Co Kilkenny), Kilmore (Co Cavan), Saint Caiman’s, Iniscealtra (Co Clare), and the north porch at Cormac’s Chapel. The pseudo-scallop capitals have close parallels at Cormac’s Chapel, and capitals with angle heads bitten by animals are also found at Cormac’s Chapel, Saint Saviour’s, Glendalough (Co Wicklow), and Dysert O’Dea (Co Clare). The chamfered moulding with pellets used on the label and imposts has parallels at the Nuns’ Church at Clonmacnoise and Rahan (Co Offaly), Donaghmore (Co Tipperary), Killeshin (Co Laois), Ullard (Co Kilkenny), Kilkenny Cathedral fragments and Kilmore (Co Cavan). The unusually elaborate figure sculpture is probably not in its original location. The pair of figures on the right jamb of the inner order seems to have been cut down from their original size to fit the recessed panel. A section of frame stops abruptly on the right porch panel, with two figures suggesting that this panel originally formed part of a longer narrative frieze. It is likely that originally there were more scenes, possibly occupying the gable, removed in the 18th century. Narrative sculpture is also found (reset) at Ullard (Co Kilkenny) and Liathmore (Co Tipperary), together with the better-known frieze sculpture at Ardmore (Co Waterford). The incised crosses on the west doorway may be later mediaeval consecration crosses. The heavy re-pointing at the junction between the porch and the face of the west façade does not help to resolve the dating of the nave fabric, as it is impossible to see whether or not the porch is contemporary with it, or whether it is a later addition. The porch is surmounted by a gable. But the upper courses here are replacements from the 19th century. There is a single circular light with chevron ornament above the porch, dating from the 18th-19th century. Again, for those who are interested in the flora and fauna of the site, the organic growth on the porch consists primarily of the lichen Lepraria and pleurococcoid green algae (Apatococcus/Desmococcus) which favour damp conditions. The occasional green “granules” seen in the interstices of loosened grains are pleurococcoid algae. Just to reassure you, these are superficial and benign, and we think they do not cause any damage. 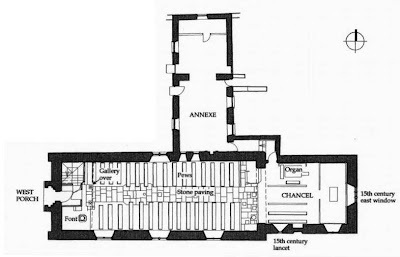 As we move in through the porch, notice there is a timber gallery across the western end of the church, which is reached by a timber stairs. When extensive works were carried out to the church in the 1730s, the porch and doorway were dismantled. The upper gable of the porch was completely removed to facilitate the addition of a large window above, lighting the new gallery within. The porch and the doorway were then put back together. The round-headed window, which you detect if you notice the scar immediately above the porch, probably dates from the 1730s. Its insertion coincides with the building of the gallery, a common addition to parish churches at that time. In the late 1860s, Welland and Gillespie replaced the 18th century west window with a neo-Romanesque, circular window, capped the antae with neo-Romanesque pellet ornamentation and reinstated the gable of the porch. The stone font in the south-west corner of the church is possibly a late mediaeval font – the date 1988 on the floor only marks the date of its re-setting. Why were fonts placed close to the main door of a mediaeval church? Inside, the church has rendered and painted walls, a hammer-beam roof, which is lower over the chancel, and timber floors that have been replaced in part with concrete. The glass and furnishings are mainly from the 19th century, with the exception of a memorial slab (1711) on the north-east wall, and a mid-20th century window with an image of Saint Cecilia. So, this afternoon we are going to look for other evidence to help us date the different parts of this church this afternoon. The earliest surviving part of the church is the western part of the nave. This was originally a single cell structure with eastern and western antae. In the 12th century, the Romanesque porch we have been looking at was added to the west gable, probably in an attempt to boost the status of the monastery. The south wall of the nave is lit by three traceried lancet windows of uniform size, and the north wall of the nave is lit by one traceried lancet window and one neo-Romanesque round-arched window at a high level. ● Can you imagine how this may have come from another, curved building? ● Was it a round tower or belfry tower? ● Did a round tower once stand on this site? ● What was the function of a round tower? On the other hand, these pieces of radial ashlar could come from the apse of another, earlier church. Anyway, this western part of the nave is the earliest part of the church building. This tells us the church was originally a single-cell structure with antae. A clear vertical joint is visible in the south wall of the nave, and shows its length as 11.27 metres. The original width was as we see it today, 7 metres, giving a width-to-length proportion of, say, 1:1.7. Churches of this type are notoriously difficult to date. The cathedral at Clonmacnoise, of roughly the same proportion, is thought to be the same church that the Annals say was built in 909 AD. However, this form continued to be used into the 12th century, as we know from the church in Roscrea where the antae have moulded quoins, and at Kilmalkedar on the Dingle peninsula (Co Kerry), where the antae are clearly coursed in with the Romanesque doorway. So, we can date this part of the church to some time between the 10th and 12th centuries. At some point in the Middle Ages, the nave was extended to the east by about 8 metres. With the possible exception of a window sill in the south wall, there are no contemporary dressed features. This phase of building, obscured on the north wall by the 19th-century annexe, incorporates a number of pieces of reused stone both in the wall fabric and the quoins. The church which initially occupied this chancel area was extended eastward by the addition of a diminutive chancel structure, probably during the 15th century. We can see evidence of this extension in the small lancet, which is typical of the 15th century, coursed into the fabric of the south wall. A record of a blocked, ogee-headed piscina, uncovered on the interior south wall during renovations in the early 1950s, also suggests this date. Scarring on the southern part of the east gable indicates the prior existence of a third diminutive extension to the east, accessed through what seems to have been quite a low archway. The dating of the extension of the nave is difficult due to the lack of diagnostic features. The use of ashlar in building round towers was uncommon before the 12th century, so its secondary use provides a likely terminus a quo of at least the late 12th century for this section of the church. The extension eastwards of earlier church buildings was common in the 12th century. However, had the building been extended during this period, we would expect the addition of a chancel accessed through a carved chancel arch, as can be seen in similar churches such as Fore Abbey (Co Westmeath) and the Cathedral in Glendalough (Co Wicklow). However, there is no evidence of this in Freshford. The sill in the fabric of the south wall of the nave extension is comparable in style to the sill of the 15th-century lancet in the chancel, and is level with it. While not conclusive, this suggests that the two extensions were carried out at the same time. The addition of the third cell is also difficult to date, and its function is uncertain. Although Bishop Tenison noted in the 1730s that the nave was in sufficient repair to be used, it appears considerable renovations were carried out in the 1730s. The division between the nave and the chancel is marked by a change of floor level and a 19th century pointed arch of dressed limestone. The south wall of the chancel is lit by two windows of differing age and dimensions. The western-most window is a small plain lancet window; the eastern-most of the pair is a larger lancet with tracery similar to the windows in the south nave windows. Have a look at the blocked, pointed arched doorway between the two windows. The north wall of the chancel is blind. Why do you think this is? 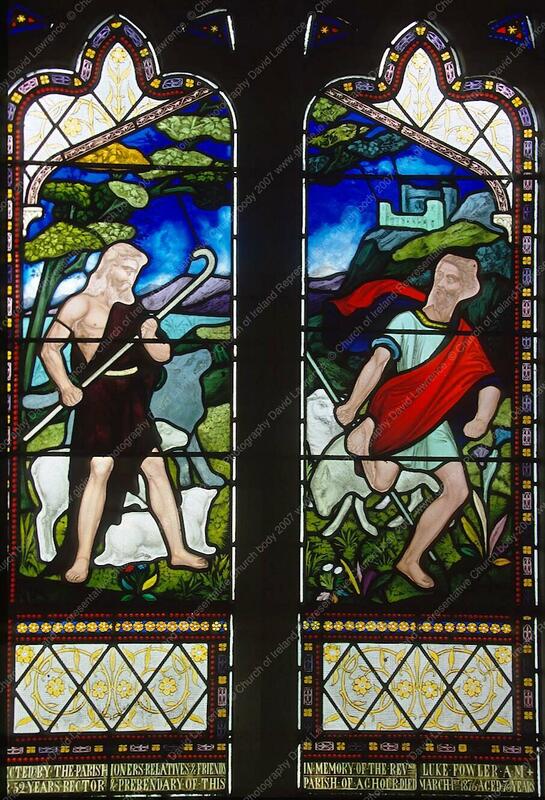 [Hint:] Have you noticed, too, that the north wall in Saint John’s Church in John Street, Kilkenny, is also blind? The east window is a large lancet window with elaborate tracery infill. The earliest documentary source for the fabric, the Visitation records for 1622, recounts that the chancel was in a “ruinous” condition. This appears to have remained the case until 1731 when extensive repairs were carried out. The only source surviving for this work is an account in the 1730s by Bishop Tenison, when he refers to the presence of timber for the repair of the church. However, later descriptions say the church is in “good repair,” and it seems the renovations were more considerable that simply hoarding and repairing with a little timber. Firstly, we have evidence that the northern corner of the chancel was substantially rebuilt. Traces of two parallel vertical joints in the north wall close to this corner suggest the original presence of a doorway in this position. This probably corresponds to the record of a “Gothic” doorway, uncovered during the internal renovation to the chancel in the early 1950s. There is now no trace externally of any dressed stone belonging to this entrance. However, the width of the ope corresponds closely to the width of the blocked, re-set doorway in the south wall, so it is possible that the stones were re-set in this position in 1731. It is possible that the third cell was the chancel in “ruinous” condition and was fully demolished at this time. 1, The South Windows in the Sanctuary: These are two lancet windows; we see Angels with scrolls; the widows measure 1650 mm x 460 mm. The glass commemorates Elizabeth Wynne, the first wife of Canon Robert Fowler, and was made by O’Connor of London (1858). Note the impaled Fowler and Wynne heraldic arms in the bottom right corner. 2, The Chancel, south (second from east): one lancet window depicting Saint Cecilia, holding a scroll or book with the words “Peace Perfect Peace.” It measures 1270 mm x 280 mm. No artist or studio identified, but it dates from 1956. This window commemorates the Revd Canon Charles Angus Cutts Purkis, who died at the organ in 1956. He was the last Rector of Aghour before the parish was united with the Kilkenny Cathedral group of parishes. 3, Nave, south (second from east), two lancet windows, measuring 2130 mm x 660 mm, with one quatrefoil and four small tracery lights. This window commemorates a former curate of Aghour, the Revd James Mease. This is the work of O’Connor, London (1864). 4, Nave, north (east-most), two lancet windows depicting shepherds, measuring 1960 mm x 610 mm, with two trefoils and four tracery lights. No artists are recorded. These windows date from after 1876, and commemorate Canon Luke Fowler, who was Rector of Aghour for 52 years (1824-1876). His father, the Right Revd Robert Fowler (1766-1841), was Bishop of Ossory (1813-1841), and his grandfather, also Robert Fowler (1726-1801), was Archbishop of Dublin, while his uncle, Richard Bourke, was Bishop of Waterford and Lismore (1813-1833). The single-storey annexe is used as a vestry and for meetings. It was built in 1824 as a vestry and Sunday school. It abuts the north façade of the church and extends to the north boundary of the graveyard. It is connected by a short corridor to the northern wall of the chancel. The west front is four bayed, with two central doors flanked by diamond-paned square windows. It is built of limestone rubble, with roughcast render on all the exterior walls, and a stone slate roof. The annexe has a timber-boarded floor, rendered and painted walls, and a raised-collar, timber-sheeted ceiling. A timber-sheeted panelled partition has been built at the northern end of the room. By 1270, Bishop Geoffrey St Leger had completed building the episcopal manor houses at Aghour and Durrow. Martin Gillespie says while William Ledred, Bishop of Ossory (1317-1361), was prosecuting Alice Kytler as a witch, he wrote many of his letters from Uppercourt. In 1500, Bishop Oliver Cantwell built a castle at Aghour beside the episcopal palace. Uppercourt remained the favoured residence of the Bishops of Ossory until the 1550s when John Bale, Bishop of Ossory (1552-1553) so outraged the people of Freshford and Kilkenny with his zealous interpretation of the Reformation that they murdered five of his servants in a field and forced him to flee for his life on 8 September 1553. In 1570, Christopher Gaffney, Bishop of Ossory (1566-1576), granted the manor of Aghour to Sir Richard Shee (ca 1550-1608), who also built Shee’s Alms House in Rose Inn Street, Kilkenny, at an annual rent of £10. The Manor of Uppercourt, included the whole civil parish of Freshford and almost 3,000 acres, was inherited by his son, Lucas Shee. Lucas Shee’s second son, Robert Shee, inherited Uppercourt and became Mayor of Kilkenny in 1635. The Confederation of Kilkenny was formed in his town house in Kilkenny in .He forfeited Uppercourt during the Cromwellian era, and it was granted to Sir George Askew in 1653 in lieu of £200 owed as wages to his soldiers. By the early 18th century, Uppercourt belonged to the Ryves family. The visitation of 1731 records a bequest by Penelope Ryves to the church around 1711, and a mural slab in the chancel of the church of the same date records her death. Her granddaughter, Mary Juliana Ryves (d. 1812), married Sir William Evans Morres, MP for Kilkenny. The Morres family aggrandised their surname in 1815, when Sir William’s second son, the third baronet, renamed himself Sir William Evans Ryves de Montmorency (1763-1829). He began building a new house at Uppercourt, designed as a free-standing classical country villa ca 1790. It may have been designed by John Roberts of Waterford. His monument can be seen in the south aisle of Saint Canice’s Cathedral, Kilkenny. Sir William died in 1829, and his illegitimate son, William de Montmorency continued to live at Uppercourt until 1840. But there were substantial family debts, and in 1840 Uppercourt was sold through the Court of Chancery, and was bought by George Bryan of Jenkinstown. Later, Uppercourt passed to the Eyre family. The Eyre family, and in particular Thomas Eyre, had a philanthropic interest in Freshford. They built the male and female schools, funded the building of the Roman Catholic church and installed the pumps on The Square. This house was greatly altered for the Eyre family around 1875 by the architect JJ McCarthy. An extra storey and a three-storey east wing were added. The stuccodores who worked at Uppercourt also exercised their art on a small house within the village where they lodged, but this has since been demolished. Another local philanthropist at the time was Emma Browne Clayton, who built the town hall around the corner from here on the north side of The Square and donated it to the town. She also built eight two-storey houses on Kilkenny Street, replacing run-down thatched huts. These houses were given to the Jubilee Nursing Association to lease to deserving applicants at a low rent. Meanwhile, during World War I, Uppercourt became the seat of the Headquarters Staff, and was temporarily occupied by Lord Roberts, the British commander-in-chief, and Sir Evelyn Wood. After World War I, Stanislaus Eyre, who planted the trees on the Green in Freshford, sold Uppercourt House and Demesne, including 500 acres, to the Maher brothers in 1918. It was sold in 1929 to Mill Hill Fathers, who altered the house again, built a new church and added a wing to accommodate the students. At one time, there school had 115 boarders and 12 day students. The manor now stands on a stud farm owned by Dr Paul O’Byrne who has restored the house in recent years. The remains of a cross stand in the village green. It is made of sandstone and has been worn away by the weather. It was originally erected behind Uppercourt Manor in 1622, in memory of Lucas Shee and his wife Ellen, daughter of Edmund Butler, 2nd Viscount Mountgarret. The cross was moved to its present location on the village green by Sir William Morres in 1790. Only the base of the cross survives. ● The fonts in neighbouring Saint Lachtain’s Roman Catholic Church, Freshford. ● Tobernapeastia, of which there are now no visible traces above ground. Although the traditional pattern is no longer held, the site is still significant locality. A large and prominent feature, identified as an unusual example of a motte and bailey from the late 12th or early 13th century, stands on a steep ridge in the townland of Moat. Its location close to Freshford underlines the prominence of the site during the 12th century. Another monument of this period, identified as a possible watermill located in Freshford Lots, may be the site of an early castle shown on the Down Survey Map of 1665. This may have succeeded the motte and bailey and was demolished after Uppercourt was built. Saint Lachtain’s Church is unique in Ireland. The doorway is as important archaeologically as the doorways in Cormac’s Chapel in Cashel, Co Tipperary, and Saint Brendan’s Cathedral in Clonfert, Co Galway. Because this church is a complex historical monument, the church and site have a unique educational value as an aid to understanding church history. Worship has continued on this site, perhaps Sunday-after-Sunday, for almost 15 centuries since the monastery was founded in the early seventh century. The worship has continued through from an early Celtic monastery, through a medieval church seeking cathedral status, to a parish church with a particular link to the bishops and cathedral of the Diocese of Ossory, to the Reformation, and the changes since then, including the establishment and disestablishment of the Church of Ireland, to the present day, when it serves as an ordinary parish church. This site and this church are of social importance and remain a significant landmark not only for the local congregation, not only for the Church of Ireland, but for the wider community, in Co Kilkenny, and nationally. 622: Saint Lachtain, died 19 March 622. 809: (? recte 814) Boelgaile of Achadhur dies (The Annals of the Four Masters). 899: Ceannfaeladh, son of Cormac, ‘Airchinneach of Achadhur,’ dies (The Annals of the Four Masters). 1018: (?recte 1019), Ua Brodubhain, Abbot of Achadhur, killed. 1352: William de Bromley; became Dean of Saint Patrick’s Cathedral, Dublin. 1540: Patrick Walsh, he became Bishop of Waterford and Lismore, and was allowed to annex the Rectory of Aghour to his Bishopric in 1551, and held both until his death in 1578; his son Nicholas Walsh was Bishop of Ossory. 1661: Humphrey Whittington; later Archdeacon of Dublin. 1677: Edward Jones; later Bishop of Cloyne (1683), Bishop of St Asaph (1692); buried under the Communion Table in Saint Margaret’s Church at Westminster Abbey. 1684: Martin Baxter; later Dean of Connor. 1704: George Walter Story; also Dean of Connor and Dean of Limerick. 1772: Thomas Hewetson, former Master of Kilkenny College. 1824: Luke Fowler, son of Robert Fowler, Bishop of Ossory. Married twice (1825, Elizabeth Wynne; 1864, Elizabeth (Jefferson), widow of Dean Charles Vignoles. 1957: Robert Bonsall Pike (afterwards Bishop of Meath). 1969: Donald Arthur Richard Caird (afterwards Bishop of Limerick, Bishop of Meath, and then Archbishop of Dublin). Leslie points out that Fowler was rector from 1824-1876, and McCheane from 1876-1926, so that in 102 years there were but two rectors, and asks whether this is a record. Quinlan, M, and Foley, T (eds), Saint Lachtain’s Church Freshford, Conservation Plan, unpublished report, Heritage Council (2000). ‘The Corpus of Romanesque Sculpture in Britain and Ireland,’ http://www.crsbi.ac.uk/search/county/site/id-kk-fresh.html, accessed 13.08.2013. Bence-Jones, Mark, 1978, A Guide to Irish Country Houses (London: Constable, 1988). Brash, RR, The Ecclesiastical Architecture of Ireland (Dublin: WB Kelly, 1875). Carrigan, (Canon) William, The History and Antiquities of the Diocese of Ossory (Dublin: Sealy Bryers and Walker, 1905, 4 vols). Comerford, Patrick, ‘Bale’s Books and Bedell’s Bible: Early Irish translations of Word and Liturgy into Irish,’ pp 124-128 in Salvador Ryan and Brendan Leahy (eds), Treasures of Irish Christianity, Volume II, A People of the Word (Dublin: Veritas, 2013). Curtis, Edmund (ed. ), The Ormond Deeds, (Dublin: Irish Manuscripts Commission, 1932-1943, 6 vols). De Breffny, Brian, and Mott, George, The Churches and Abbeys of Ireland (London: Thames & Hudson, 1976). Egan, PM, 1884, Illustrated guide to the City and County of Kilkenny (Kilkenny: PM Egan, 1884). Flegg, Eleanor (ed), An Introduction to the Architectural Heritage of Co Kilkenny (Dublin: Department of the Environment, Heritage and Local Government, 2006). Gillespie, (Revd) Martin, ‘Uppercourt Manor,’ Old Kilkenny Review, No 25 (1973), pp 42-47. Healy, (Revd) William, History and Antiquities of Kilkenny (City and County) (Kilkenny: PM Egan, 1893). Lanigan, Katherine M, ‘Freshford Doorway,’ Old Kilkenny Review No 21 (1969), pp 5-10. Leslie, (Canon) JB, Ossory Clergy and Parishes (Enniskillen: EH Ritchie, 1933). Macalister, RAS, Corpus inscriptionum insularum celticarum (Blackrock: Four Courts Press, 1945). Nolan, William, and Whelan, Kevin, (eds. ), Kilkenny, History and Society (Dublin: Geography Publications, 1990). O’Kelly, Owen, The Place-Names of Co Kilkenny (Kilkenny: Kilkenny Archaeological Society, 1985). Pike, Joan, ‘Medieval Fonts,’ Old Kilkenny Review Vol 4, No 1 (1989), pp 572-582, 597-598. Canon Patrick Comerford is Lecturer in Anglicanism, Liturgy and Church History, the Church of Ireland Theological Institute, and an Adjunct Assistant Professor, Trinity College Dublin. This lecture in Saint Lachtain’s Church, Freshford, Co Kilkenny, on Sunday 18 August 2013, was part of the programme for National Heritage Week organised by the Kilkenny Union of Parishes. Wow! Fantastic pieces with a lot of research—so glad you brought all the information together in one place! I moved to Freshford when I was 3 years old and I have never knew how deep the history is here I love the photos of the church and I really enjoyed reading your piece my children will know about their tiny little village and all of its history thank you so much Patrick.